Jevity 1.2 Cal contains a unique patented blend of 75% insoluble and 25% soluble fibers, a proportion that represents the types of fiber found in a diet containing a wide variety of foods. The sources are oat fiber, soy fiber, gum arabic, and carboxymethylcellulose. This blend of fiber sources was selected for its water-absorbing ability, fermentability, contribution to stool bulking, and minimal contribution to product viscosity. 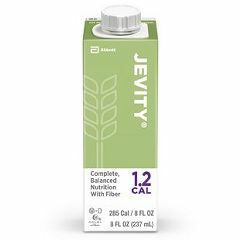 The total dietary fiber content of Jevity 1.2 Cal is 12 g/L (2.85 g/8-fl-oz serving) or 10 g/1000 Cal, within the recommended range—10 to 13 g/1000 Cal—for daily fiber intake. My grandmother was diagnosed as glucose intolerant. This product helps to replace Isosource HN as her source of nutrition through her feeding tube. Good Taste. Acts Quickly. Simple To Take. Produces Results. Older People. Daily Use. Women. I bought this product for my mother that is 65 years old. She didnt want to eat solid foods very much so I would suppliment 1 meal with "Jevity". Since then she has more strength to get up and stay up longer. She looks healthy and best of all some of the complaints from the medications she was taken are going away. This product gave her suppliments she was laking. Simple To Take. Produces Results. Nutritional. Daily Use. Older People. Feeding Tube. Women. Men. Short-Term Solution. Long Term. This was the brand they gave my Mother in the hospital. She is on a feeding tube and this has all the nutrition she needs. I was so happy to find it online and especially here at Allegro with their super fast shipping!! The best formula I have been on! Good for j feeds. Produces Results. Simple To Take. Acts Quickly. Continuous j tube feeds. Daily Use. Women. Regular User. Tubefed since 2004. I have been on several different formulas over the past six years. Jevity is by far the best. It has a good consistancy for my j tube feeds. It is easy to open in its can form. I don't jurt my fingers in the middle of the night opening a can! I feel more nutritionally stable on it then on any other formula I have been on. I tolerate it well. Having a choice between 1 calorie per ml and 1.5 calories per ml is an added bonus. It smells bad but then it is not meant to be swallowed! I will keep using it forever! Produces Results. Acts Quickly. Simple To Take. by GVE from Tallahassee, Fla.
how many calories are in a can of Jevity 1.2? will it cause weight gain? we have a few cases of Jevita 1.2 cal left after a family member finally died from cancer. is this product ok for a healthy adult to drink as a nutrition drink on a regular basis? Maybe replacing one meal in a day. what is the can of the jevity 1.2? is it a can or aluminum. my main question is, if it is recyclable?